ThinkFun sends my family new games to review regularly and of course we're always happy to try out something new. The great thing about ThinkFun is that all of the games that they have created are far from both average and boring. The latest one that we received was the Maker Studio: Gears Set. Give my son something to build and he's thrilled. He was really looking forward to using this set. We went over the booklet and decided that we were going to try and make every vehicle in it. We had the box needed and all of the required pieces, but honestly the directions were not all too clear for me. I knew that if I couldn't understand them, there was probably no way my 7 year old was going to figure it out either. I tried my best to eyeball the design--you know---where to poke holes and make cuts, but I still could not seem to get it right. 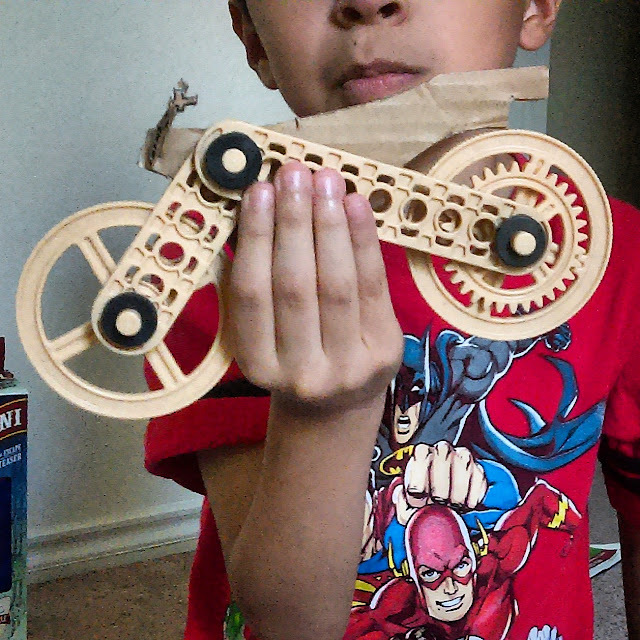 My son helped me insert the gears and rods, and my cuts ended up being pretty off. We changed our minds and started on the three wheeler. This one is actually our favorite. It came out the best and wasn't as complicated to make. I didn't cut it perfectly, but it worked out just fine. My son helped me insert the right gears, connectors, wheels, and rods. Then, he played with it for a few days straight. He loved it. We tried a few of the challenges as well. Fun times. Our second favorite project was the motorcycle. The final product looked nice but it was far from perfect. It wouldn't stay in one position because the card board we used was slightly thinner than the size called for. I tried really hard to cut it exactly as shown in the picture inside of the instruction booklet. My son thought this one was cool, but like myself, he loved the three wheeler better. 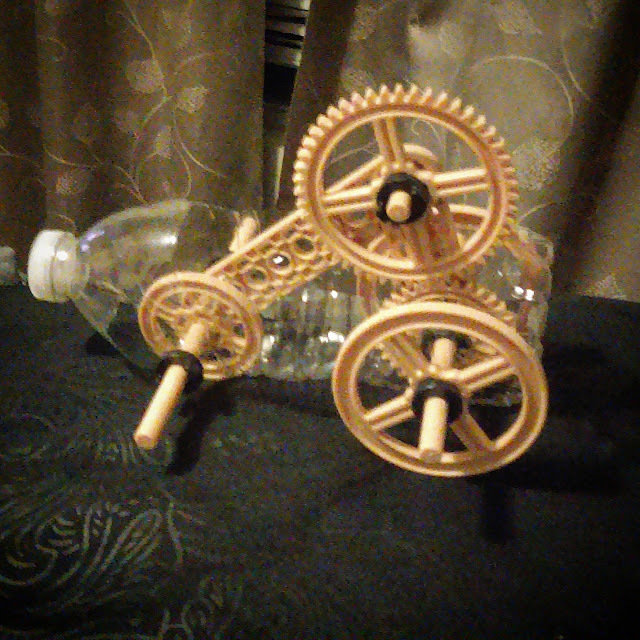 We never ended up getting to the last project, which involved an empty yogurt cup because my son ended up wanting to just rebuild the three wheeler and kept it like that. Fine with me. I know that the box says for ages 7 and up, but I know as far as my own kid, and he's usually really good at this sort of thing, but there is no way he could possibly have made these on his own. The directions need to be a bit more specific, in my opinion. I do like that you can use recycled boxes and bottles, etc, to build the vehicles. You don't have to go out and buy anything expensive to build these things. Most people have a water bottle or soda bottle, macaroni or rice box, some cardboard, and such. I think it would be even better if it came with additional pieces, so that you don't have to take a previous project apart to build a new one. Learn more about Makers Studio Gears.